LUMUT, Malaysia - As part of a growing number of maritime exercises held each year between the U.S. and Malaysia, Sailors from both partner navies kicked off Maritime Training Activity (MTA) Malaysia 2018 in Lumut, Oct. 8. 2018 marks a significant growth in the relationship between the U.S. and Malaysia as both partner navies expanded their role in this year’s 24th iteration of Cooperation Afloat Readiness and Training (CARAT), 17th iteration of Southeast Asia Cooperation and Training (SEACAT), 13th iteration of the Pacific Partnership, and 26th iteration of Rim of the Pacific (RIMPAC). Maritime exercises conducted between both partner navies are designed to address the full spectrum of maritime operations with CARAT focusing on maritime security operations (MSO), PP aimed at humanitarian assistance and disaster relief (HA/DR), and SEACAT on information sharing and maritime domain awareness (MDA). 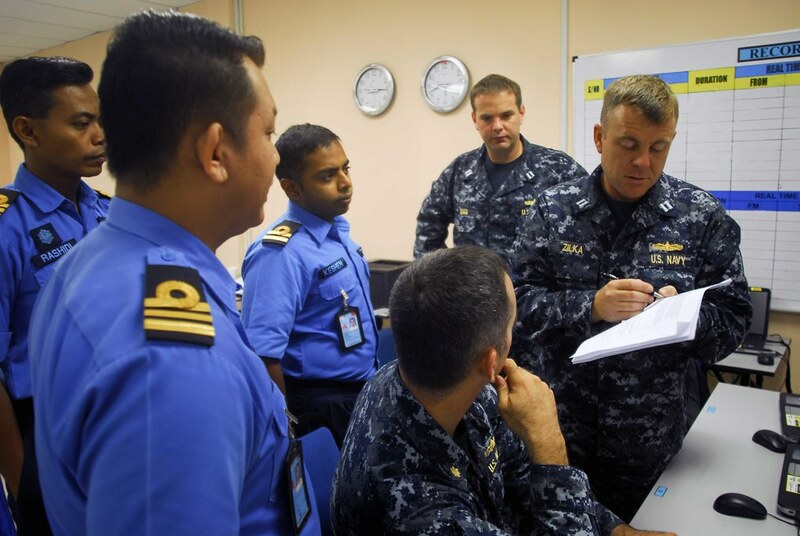 MTA Malaysia involves subject matter expert exchanges across a broad range of maritime operations to include mine countermeasures, electronic and anti-air warfare, maritime domain awareness and engineering techniques. Each session is designed to facilitate learned discussions with dozens of specialized professionals in numerous focus areas such as search-and-rescue of trapped victims in sunken vessels, research-and-recognition of terrorist or piracy acts, and application of math and physics concepts in diving and salvage operations. “Royal Malaysian and U.S. Navy defense diplomacy has been in existence for a long time and has been translated into previous bilateral exercises such as CARAT, which began in 1995,” said Capt. Abd Halim bin Hj Shaari, Royal Malaysian Navy assistant chief staff for future operations. “MTA is another initiative for both navies to work together and be on the same page in ensuring maritime security and regional stability. This will also provide the Royal Malaysian Navy a great chance to enhance their skills and capabilities beside knowledge and experience sharing between U.S. forces." CARAT 2018 consisted of a full amphibious assault demonstration with F-35B Lightning II fighter jets. Furthermore, the Royal Malaysian Navy deployed a warship, KD Lekiu (FFG 30), to RIMPAC for the first time, demonstrating the navy’s increased capability to operate effectively with the U.S. Navy.